Trudel and Sons Roofing: Asphalt Roofing Systems: Freedom of Selection or Overkill? Asphalt Roofing Systems: Freedom of Selection or Overkill? There are many different options from a variety of manufacturers when deciding which asphaltic roofing material to use for a building. But is having so many choices necessary, and could it cause more harm than good? 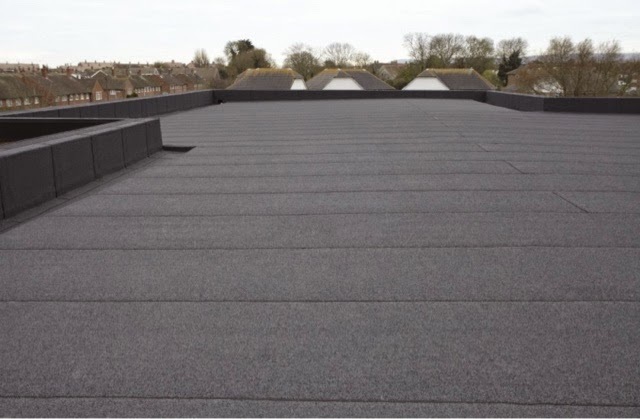 Asphaltic roofing has been around for more than 150 years and has many advantages in the commercial market, including long life, multi-ply redundancy, and outstanding puncture resistance. However, the market share has decreased as a result of competition from less expensive single-ply membranes, and now the sheer quantity of offerings—which are estimated between 800-1,000 asphalt roof systems per manufacturer—doesn’t make sense in this smaller market. In contrast, TPO, which is larger than the asphaltic business, has about 75 percent fewer systems. We understand the competitive pressure out in the marketplace and it’s nice to give customers a choice, but there are risks involved. It could cause confusion as professionals scramble to understand so many roofing systems, complicate the sales process, and drive up the cost for distributors, manufacturers, and, ultimately, customers. Instead of focusing on how many different ways we can arrive at the same result, we should focus on what is the most cost-effective way (from an installed cost standpoint) to arrive at the desired result. For example, if a customer is looking for a 20-year hot mopped system over insulation, there are approximately 20 different combinations (i.e., systems) possible, but only one is the most cost effective: the one that requires the least steps and less labor. When we approach solutions this way, we find there are products that are not needed and certainly many systems that are not delivering value to customers. The benefit of changing to a more manageable set of roofing choices is that it will result in less confusion with easier-to-understand procedures, saved time and labor, and simplified training. As a specifier, consultant, or contractor, you’ll know that you’re choosing a system that is reliable and meets your customer’s needs. As a manufacturer or distributor, it means less SKUs to manage, which saves costs associated with codes approvals, manufacturing, and storage. And ultimately for customers it means a more streamlined decision process and cost-effective solution. For all parties involved, it is a win-win situation. Trudel is taking the lead in focusing on simplifying the sale and creating value for our customers. If more manufacturers follow suit, it can eventually improve competitiveness and cost in the asphaltic industry. Labels: asphalt, benefit, build, building, business, construction, material, roof, roofer, roofing, tips.